I intended to do a neon fashion board, but ALL my recent pins have been mint green and with St. Patrick’s Day on the horizon- why not create a green fashion board? 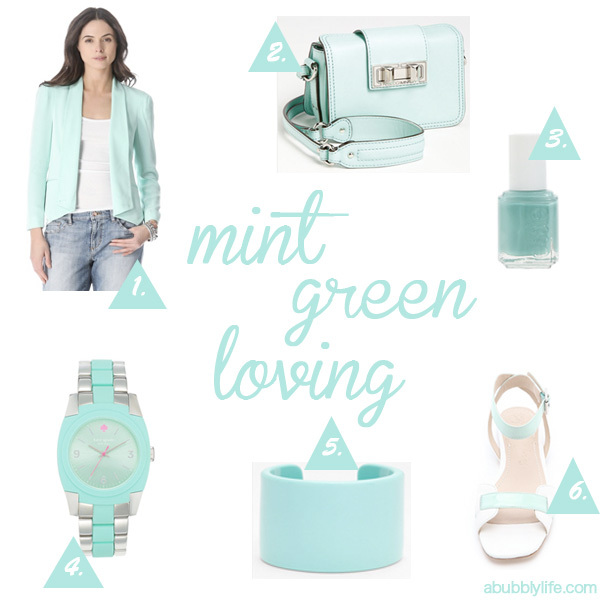 1- Rebecca Minkoff mint green blazer- I think blazers are an essential staple- dress it up or down. 2- Rebecca Minkoff purse– I guess I have a bit of a crush on Rebecca this fashion board! 3- Essie mint green nail polish– An item I can afford for my mint green obsession! 4- Kate Spade watch– I am not watch wearer but I heart this watch.